Andrew has agreed to become a fashion model for the evening for a special charity fashion show. Claire Lomas and friends are organising a fundraiser for Spinal Research and Claire's Walk Campaign. This fundraising fashion show will take place at Newbury racecourse on Saturday 16th January. The special evening will also include a two course dinner and music. Various designers have already offered lots of clothes for the show and a auction. 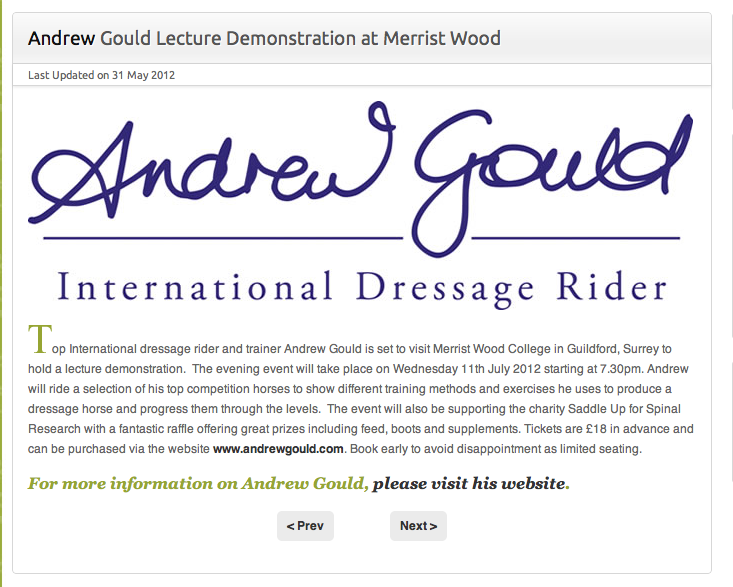 Many riders and celebrities have already committed to joining Andrew in the show. Newbury racecourse have kindly donated a room that caters for 650 guests and the catwalk will run through the centre! Andrew said: "I think it will be great fun and if we managed to raise some funds for Spinal Research and Claire's Campaign I think it is well worth the effort, I just hope I don't trip or make a complete fool of myself!" 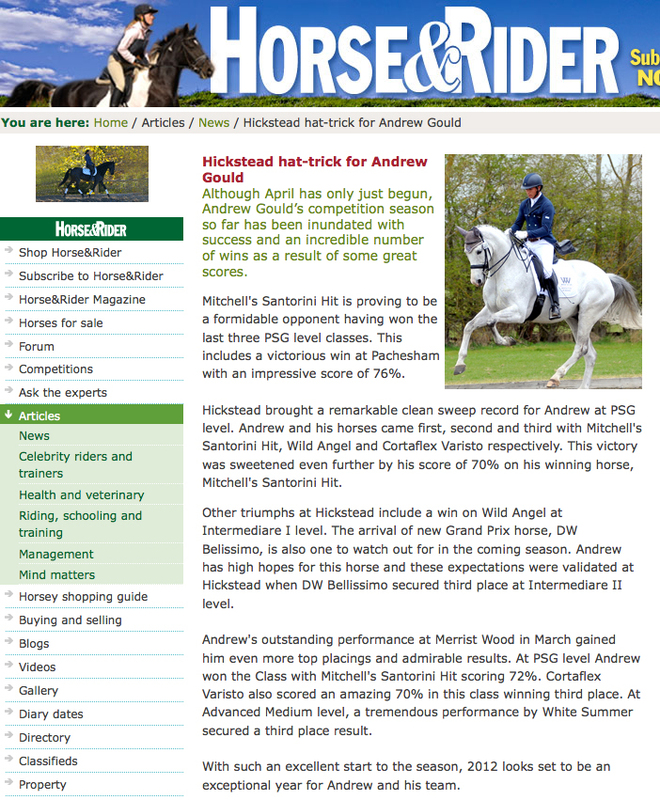 Andrew took Special II to Step by Step where he won the medium - his second win this week at this level. The bay gelding is by Ferro but his mother line is unknown. 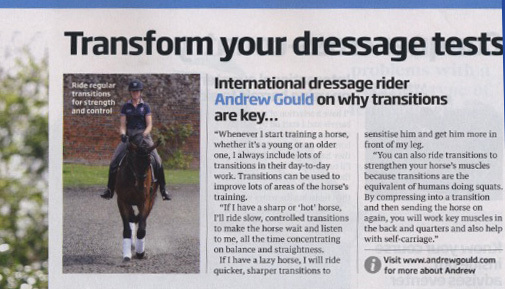 The horse has previously been a showjumper and only started doing dressage two years ago. Andrew said "He can be quite naughty and cheeky but today he didn't make any mistakes or blow ups so we are getting better! He has changed shape so much in just a few months and I think the stronger and he gets the better he will be". Andrew also was 2nd in the elementary on Jordan's Cross Dresser loosing out to best friend Daniel Timson. This was the horses second show. 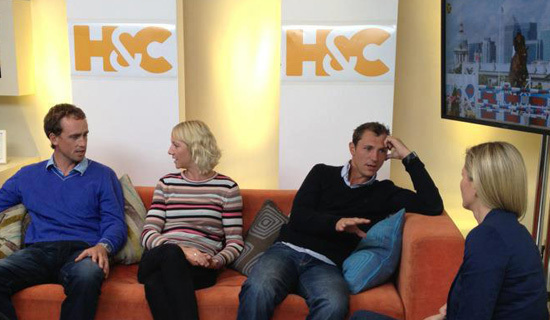 "He is for Kate to compete as he has such a good temprement and she rides him really well. I am just taking him out to a few shows but soon it will be Kate's turn!". Mandy Crouch's Wild Angel won both Advanced Mediums today at South of England Dressage show with impressive scores of over 70%. This is the mare's fourth win in just a week. Wild Angel is by Donnerschlag out of a Rhodiamant mare. 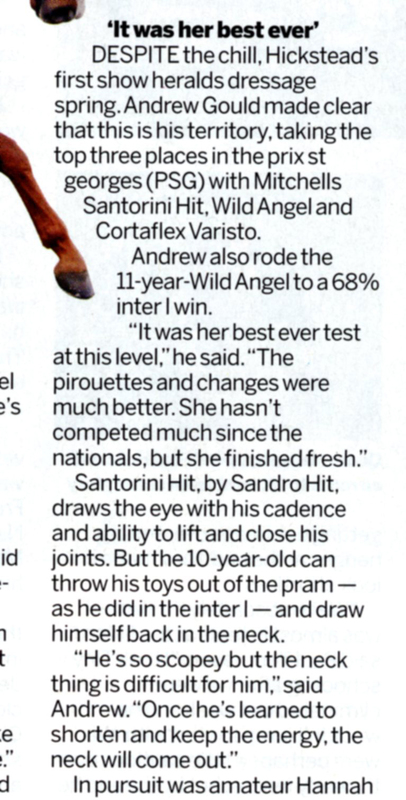 Andrew said "I haven't competed her all summer as I wanted to get her secure at home and it has paid off. She has come out so much more established and has a lot more quality due to her improved strength. Its been a hard month as I have 4 horses all at the same levels and trying to qualify them all means I have to travel around to lots of shows - but that is why I do my job I love competing and I'm so pleased with how they are all going at the moment." Special II owned by Louise Ritchie won the medium at his first attempt at this level. They also scored over 70%. "I taught Louise in Scotland where I go to teach the U21's Development Programme and she was having trouble with Special. He is very talented but he was getting the better of her. Therefore he has come to stay with me over the winter so I can bring on his training at home and also help get him easier in the ring for her. I was very pleased with today as he is still weak and I thought he coped well with the higher level." said Andrew. 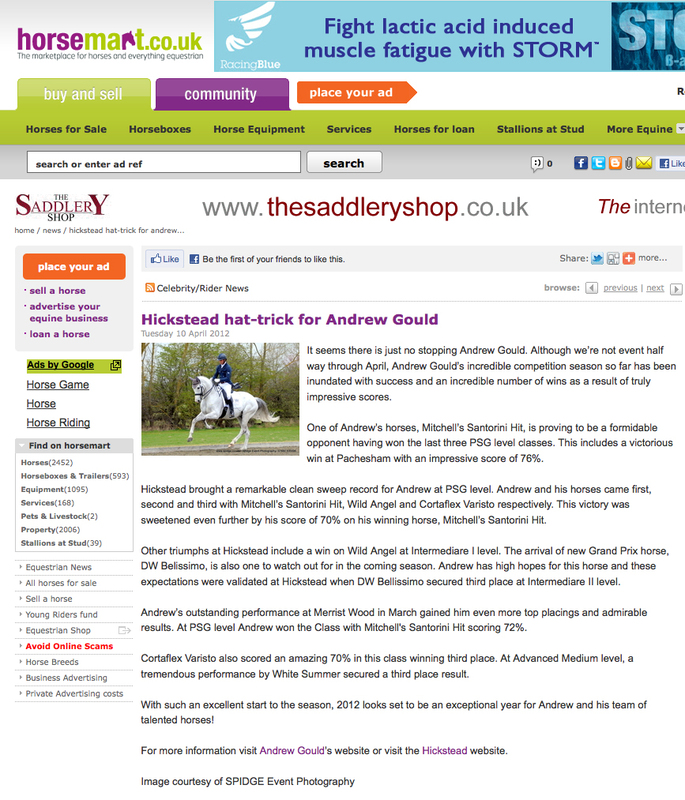 Andrew wins 3 classes at Pachesham despite no sleep! 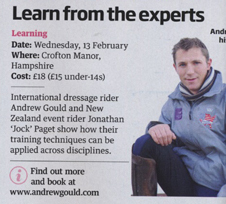 Andrew scooped 3 classes at Pachesham this weekend despite getting hardly any sleep the night before. Andrew's brother was badly injured after jumping out a travelling car on the M3 and Andrew and Polly spent most of the night waiting to hear test and scan results. We are happy to report that Andrew's brother was very lucky and has alot of cuts and bruises but is going to walk away from this accident fine. 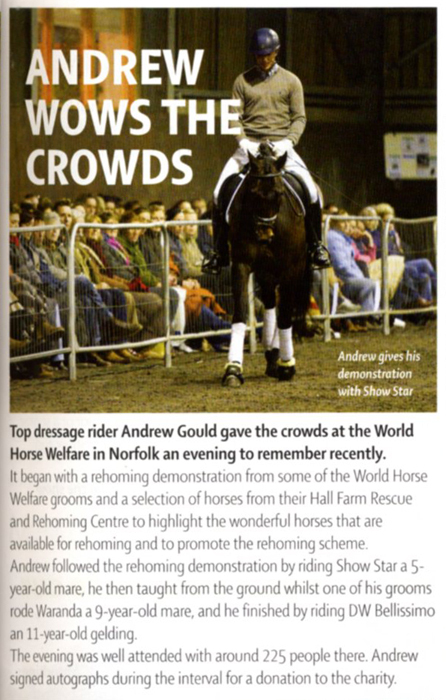 Andrew said "It was a hard decision whether to go to the show as I had had hardly any sleep but we couldn't visit my brother in the morning so I thought this would take my mind of it and I'm glad I did go as the horses were excellent." He won both the Advanced Mediums on Mandy Crouch's Wild Angel. The mare's first attempt at this level this secured her qualification to the Winter Regional Championships. Andrew said "I haven't competed her much over the summer as I wanted to establish her at home but she has come out with much more quality. She is a hot little horse and today she was so happy to be out again." 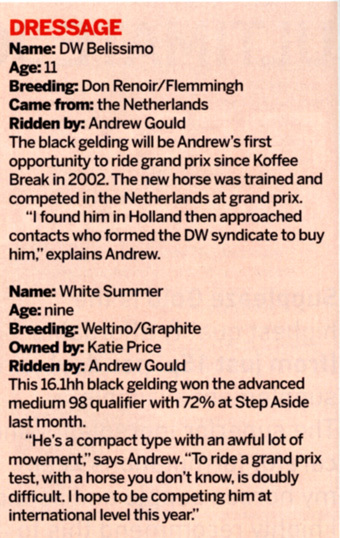 Andrew also won the Medium qualifier on Sara Green's and his parents Korenbloem Varisto. This is completes this horses qualification for the Winter Regional Championships. "I love this horse and he really is such a pleasure to ride." He also took 3rd in the Advanced Medium with a few costly mistakes. "This was his first attempt at this level but he is still green and only 7 so he just needs to take his time and get confidence". Andrew headed to Step by Step on Friday and secured qualification for the Winter Regional Championships in three more classes. Korenbloem Quercus G won the Medium Open qualifier completing his qualification and was 2nd in the Advanced Medium - his first attempt at this level. Korenbloem Varisto won the Medium Music with 75% and was second in the Advanced Medium Music with 72% taking him through to the Regional Championships. Emily Stanford who is based with Andrew won the Medium Petplan class very convincingly on Korenbloem Vincit Omnia.